I’ve been perusing planning applications recently made available on the council’s planning portal. Obviously on there are some huge and complex ones, like the outline planning application for the York Central development, but for now I’d rather focus on something much smaller and more manageable, plans to reuse and refurbish a rather sad-looking bit of Clarence Street. Numbers 32 and 34, remnants of old Clarence Street. 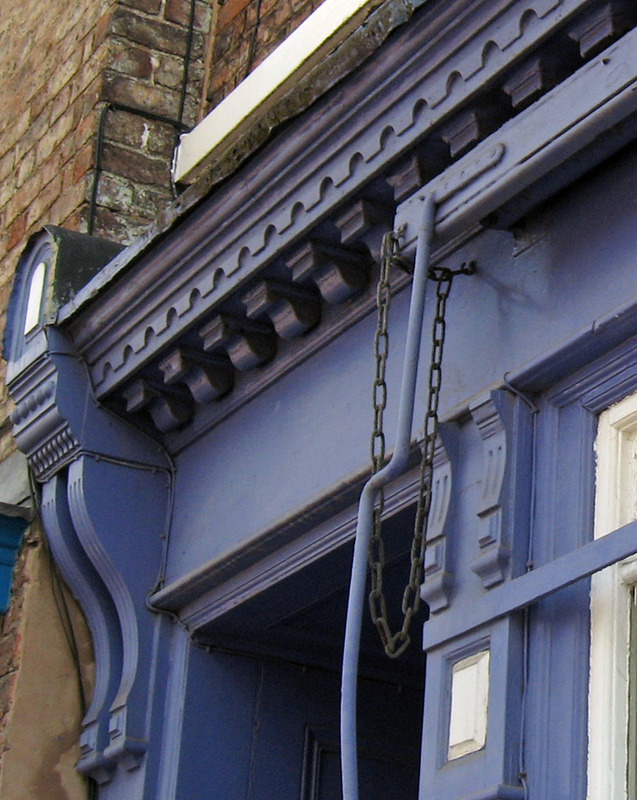 Specifically, number 34, which includes a rather nice 19th century shopfront. I’ve been passing this place for years. 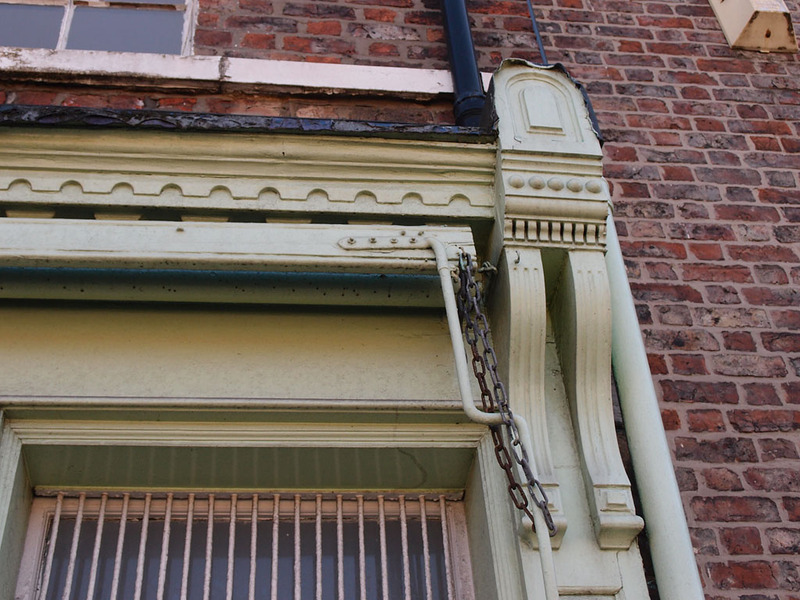 Its shopfront probably goes generally unnoticed, and I think it was some years before I noticed it, and admired it. It’s Grade II listed (as is no 32). 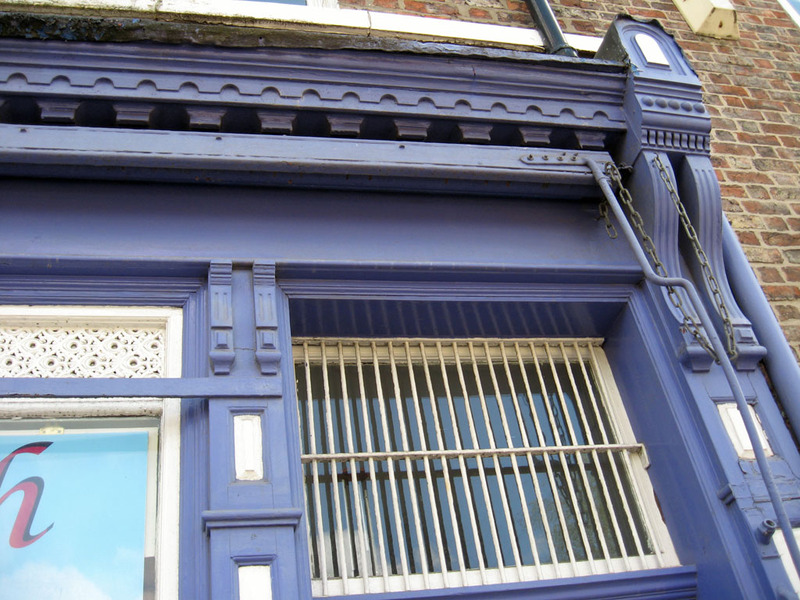 The Historic England listing refers to its late 19th century timber shopfront with pilasters, brackets and a cornice, and the ventilation grille above its shop window. 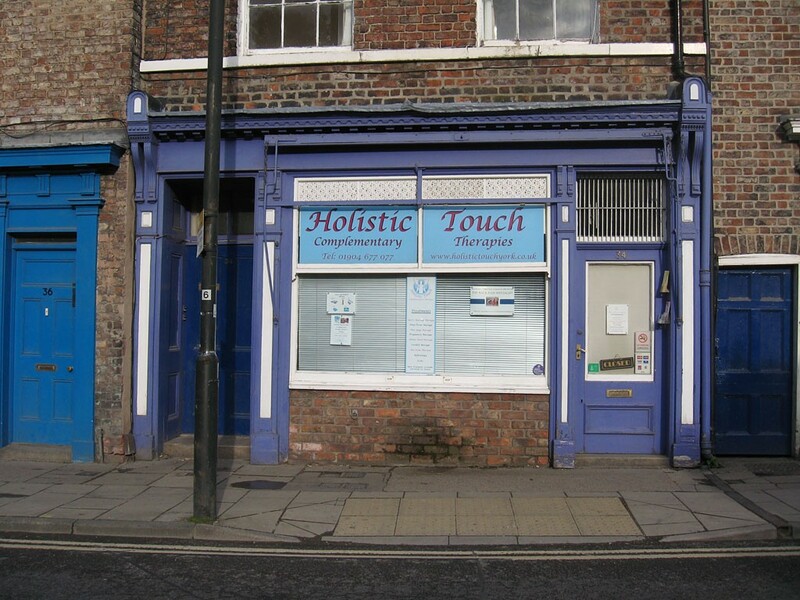 Back in 2013 it was purple, and was home to Holistic Touch, complimentary therapies. Since then it’s had another coat of paint, further obscuring the detail in its woodwork and metalwork. The University takes its responsibilities as a custodian of York’s heritage very seriously and this proposal seeks to improve and enhance these aspects of the buildings in question. Both properties are currently in a poor and dilapidated condition and have suffered from vandalism. The proposals allow for the existing fabric to be repaired and refurbished, retaining existing external fixtures and fittings and as much of the internal fittings intact. … The existing commercial façade to no. 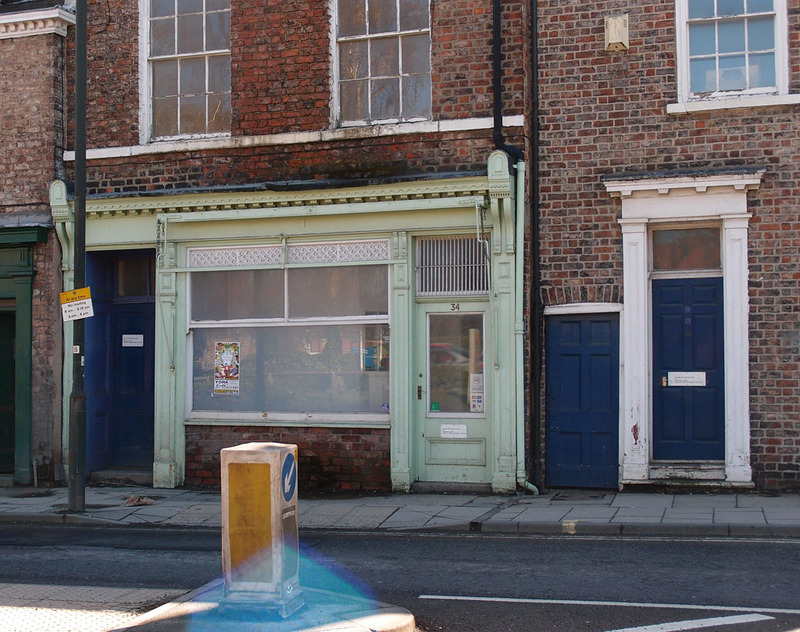 34 would be refurbished to working condition to reinstate the building’s contribution to the original ‘shop front’ streetscape where it would house a walk-in CPD service in office accommodation for University staff/students. So, it’s not going to be a shop, but it’s going to be a shopfront refurbished to ‘working condition’. Will be interesting to see what that might mean. It looks like it had some kind of awning at the front, and there’s something in there that looks like a painted-up roller blind. The aim has been to conserve and enhance the character of the heritage value of the building whilst allowing for any necessary changes and alterations to provide it with a sustainable future. I rather like Clarence Street’s shabbier bits, as they are. But in the case of number 34 it would be nice to see it refurbished. Particularly to ‘working condition’, if it means someone coming out every morning and pulling out an awning. Does anyone remember it as a shop decades back? If so, please add a comment. It’s 15 years ago today since my first wander into York with my first digital camera, 8 Jan 2004. I wrote about it in a rather reflective way ten years on, 8 Jan 2014. Today, 15 years on, I didn’t feel like a) going for a wander into York, or b) getting all sentimental and reflective, so I went for c) doing this page about something completely different, and current. But it has been a long time hasn’t it. More on that story later. … In the meantime, these ancient pages and the old crone wot wrote them always appreciate virtual coffees from kind readers. By Lisa @YorkStories • 8 January 2019 Buildings, Planning To link to this page's proper location please use the > permalink.